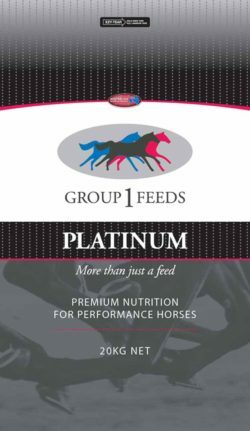 Platinum is an “oats free” feed concentrate specifically designed for the equine athlete. Eureka Platinum is ideal for horses undertaking intense training such as thoroughbred and harness racing. Eureka Platinum is also formulated to have additional grains such as oats, corn etc to meet their energy requirements. Eureka Platinum is fortified with chelated minerals as well as live yeast culture. Cooked & Flaked Barley, Maize and Lupins, Sunflower Seeds, Calcium Carbonate, Di Calcium Phosphate, Potassium Chloride, Magnesium Oxide, Salt, Mollogold, Omega enriched vegetable Oil, SCF Vitamin and Mineral Premix, Yea Sacc Live Yeast Cutlure, Fructoogliosaccharides (FOS) and Equiliser (a natural antacid for horses with problems with stomach ulcers). Introduce Platinum gradually over 7-10 days with your current feeds. Remember to match feed intake to work load. Do Not Reduce amount of Platinum on days off, reduce additional grain by at least half.